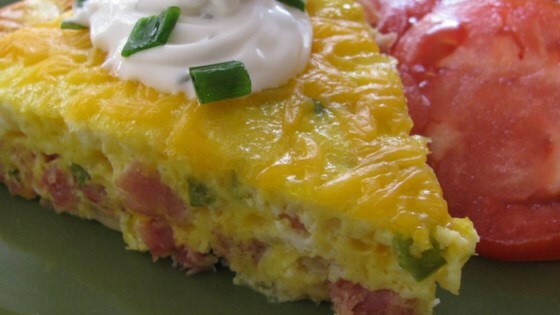 "My family loves omelets, and this is a quick and easy one. These directions are for a Denver omelet, but experiment with other ingredients to make your favorite." Preheat oven to 400 degrees F (200 degrees C). Grease a 10-inch round baking dish. Melt butter in a large skillet over medium heat; cook and stir onion and bell pepper until softened, about 5 minutes. Stir in ham and continue cooking until heated through, 5 minutes more. Beat eggs and milk in a large bowl. Stir in Cheddar cheese and ham mixture; season with salt and black pepper. Pour mixture into prepared baking dish. Bake in preheated oven until eggs are browned and puffy, about 25 minutes. Serve warm.